Since the silicone breast implant debacle in 1992, there have been few, if any, breast implant improvements. In fact, due to the “silicone scare” and the unwarranted decision by then FDA Director, David Kessler, to remove silicone implants from the market, there has been the predilection of plastic surgeons to use saline-filled implants exclusively and live with the inherit problems exclusive to saline implants; spontaneous deflation, loss of volume over time, rippling and the tendency to feel “fake,” especially if placed sub-mammary. The U.S. with our reactionary FDA fueled by the trial lawyer feeding frenzy that exists only in America left us decades behind in research and development for silicone implants. The only remaining companies that were not bankrupt during the feeding frenzy ended up being Mentor® and Allergan®, both of whom managed to develop new silicone implant products. Enter Sientra® in March 2012 utilizing years of clinical research outside of the restrictive FDA regulations to develop what seems to be a true breakthrough in silicone breast implants. Sientra® has unveiled its high strength, highly cohesive silicone gel implant which has become known as the “gummy bear” implant. Now fully vetted and approved by the FDA, these ultra-natural feeling breast implants have become the favorite of our patients and Plastic Surgeons in general. Naturally they have the same profile of possible complications inherit in breast implants except they probably never deflate. Surgeons like me are pleased with the way they feel immediately upon placement. They do require an ample infra-mammary incision and should be placed sub-muscular as their capsular contraction rate is the same as for other implants types. On a rare occasion, a patient will have had or knew of another who had a problem with the old silicone implants and prefers saline implants or if a trans-axillary incision is indicated saline implants may still be preferred. 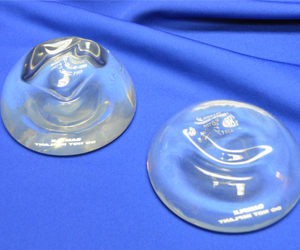 Silicone breast implants are often recommended for patients with a history of capsular contraction with saline breast implants, reconstructive breast surgery, and those patients who are more athletic. These newer generation silicone implants offer a variety of shapes and sizes including the popular “high profile” implant that creates a fuller, more youthful appearance.